Happy Full Flower Moon beauties! It is time to witness and experience the luminous shining energy that is the Full Moon once again! Lady Luna is blooming and we have the opportunity to do the same! It is time to step into your fullness and embody your bloom. And by bloom, we mean the beauty and magic that is unique to you. When you embody your bloom completely, like the flower, you magnetically draw in what is yours. Surround yourself with flowers to learn from the deep wisdom of the flora blossoming all around you. Spend time in your garden, water your flowers and plants with moon water, and listen to their unique messages. If you do not have a garden, walk around your neighborhood or park and explore the flora around you. Of course you can always buy flowers and put them in vases all around your home or altar. Make sure you gather some flowers for your ceremony later tonight! Flower petals: all colors, shapes, and sizes - whatever you are drawn to! Begin by sitting at your altar and journal about what is blooming in your life. Write your list of blessings and blooming; allow your heart to open and flow in this current of gratitude. From the current write about what you would like to bloom in your life and really describe it with all your senses... Make this a sensory experience: if you allowed these certain things to blossom and bloom what would it look like, feel like, smell like, taste like, sound like? This may seem silly but you will be inviting your whole body and all your cells into this experience and you will begin to shift your energy to receive and draw in this energy you desire. Now that you have your lists of what is blooming and what you want to bloom, begin to take off the petals of each flower you chose and write down your keywords and lists on the petals... Try to narrow it down to one word on each petal. It's okay if you don't have enough words for all the petals! Now the fun begins! Go outside under the moonlight and assemble a beautiful flower mandala out of the petals. Let your intuition and creativity guide you. You can put the Flower Moondala card in the center too. Let this creative process bring you into a meditative state... Take your time and enjoy this process. You are actively creating and attracting your desires by doing so! 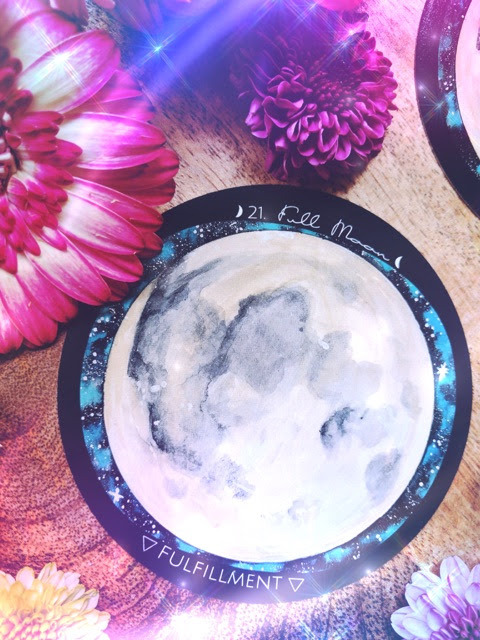 Once your Flower Moon Mandala is created take your bowl of spring water and put it at the center of the mandala on top of the Flower Moondala card. You can even add petals to the water (be sure they are safe petals because you will be drinking some of this moon water! Rose petals are always a good choice!). You can add crystals to the Moondala too, whatever you want to charge under the moonlight! Be sure to try the Flower Moon Spread in the Spirit de la lune guidebook for further insight into your bloom, desires, and your ceremony! 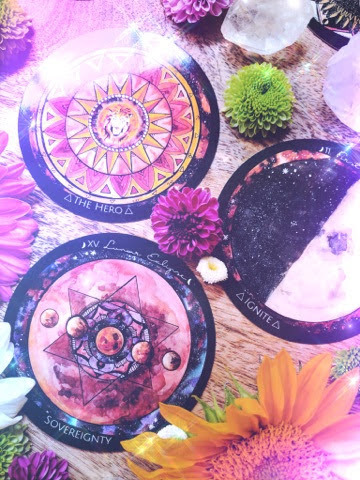 Be sure to tag #SpiritdelaLune on instagram so we can see and feature your deck! We absolutely love seeing these cards in action! We are also still moving through the #Tunetothemoon challenge on Instagram there is still time to join in! Leave these all out to charge under the moonlight and enjoy the rest of your evening. When the sun rises go outside to gather the petals and collect the moon water. If the wind scattered some petals, do not fret! Your desires are being moved through the wind! Drink some of the Flower Moon water to take it into your cells and body. You can save the rest to water your garden, use in baths, drink, or even put a drop or two into your fave ore perfumes and skincare products to keep absorbing this magick and beauty! You can keep the rest of your petals and store them in a dry dark place to let them dry for the next lunation. You can then use the dried petals as loose incense on the next Full Moon to complete this blooming magick. If you do not want to save them you can scatter these petals in your garden or out in nature and let the wind and Gaia do the rest. Listen to your intuition and do what feels best!